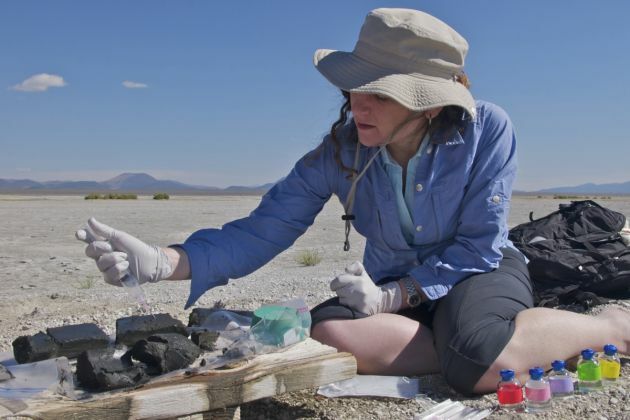 (Photo: REUTERS / Henry Bortman / Science / AAAS / Handout)Ten US seminaries to receive .5 million to include science curricula Felisa Wolfe-Simon takes samples from a sediment core she pulled up from the shores of 10 Mile Beach at Mono Lake in California as she prepares to inoculate cultures with the local microbes to search for life that can survive and flourish with high arsenic and no added phosphorus in a September 2010 handout photo released by NASA, the journal Science and the American Association for the Advancement of Science on December 2, 2010. The strange, salty lake in California has yielded an equally strange bacterium that thrives on arsenic and redefines life as we know it, researchers reported on Thursday. The finding shows just how little scientists know about the variety of life forms on Earth, and may greatly expand where they should be looking for life on other planets and moons, the NASA-funded team said. They also suggest that astrobiologists looking for life on other planets do not need to look only for planets with the same balance of elements as Earth has. The American Association for the Advancement of Science has announced it will award $1.5 million in grants to 10 U.S. seminaries for science to be included in their curricula. "Each school will develop and implement curricula with integrated science for at least two core theological courses (such as those in systematic theology, biblical studies, church history, and pastoral theology) over the next two years," the AAAS said on October 8. The "Science for Seminaries" grants will be funded by the John Templeton Foundation, the same group that funded various projects of AAAS to bridge science and faith. AAAS advisers have recommended such projects in consultation with the Association of Theological Schools (ATS). Renewal-oriented seminary Regent University School of Divinity and African-American seminary Howard University's School of Divinity in Washington, D.C. are among those who will receive the grant. "Many (religious leaders) don't get a lot of science in their training and yet they become the authority figures that many people in society look up to for advice for all kinds of things, including issues related to science and technology," said Jennifer Wiseman, director of the AAAS Dialogue on Science, Ethics and Religion. AAAS said each school will develop and implement curricula with integrated science for at least two core theological courses over the next two years. With the grant, AAAS will also provide science resources such as short science-education videos, scientist advisers from research institutions, and faculty mentors who have integrated science into seminary classes. "There are interesting intersections of all these types of courses with either modern science or the history of science or the philosophy of science that would be very useful for these students to become acquainted with," Wiseman said. Wiseman noted that the project aims to equip religious leaders with a solid scientific foundation so that they can address questions related to science. Stephen R. Graham, senior director of programs and services at the Association of Theological Schools said that Science for Seminaries will have a positive impact on theological education and also for many people served by the schools and their graduates.